Before I begin my little review, I would like to state that Andrew Graham-Dixon is at least one third of the reason that I took up Art History (the other parts being due to my fantastic teacher and my atrocious Fine Art foundation course). He is my idol, and he makes History of Art even more interesting than it already is. So, blithering over, I do realise that this is not a new programme, but I have only just gotten around to watching it. First broadcast in 2011 Graham-Dixon explores what was really going on behind the tranquil, fragile and ambiguous scenes Vermeer painted. Without further enquiry one might think that he just painted pretty pictures. But that was not the case. Take for example the very famous Girl with a Pearl Earring, painted in 1665. Nobody knows who she was or why he chose to paint this young woman. Thanks to Tracey Chevalier’s novel of the same title, her interpretation of the painting is well known. We all know the painting, the perfectly pale face of a beautiful girl looks at us from over her left shoulder, her hair wrapped in a turban of golden-yellow and that wonderful Lapis Lazuli blue. She wears a plain olive-brown coloured jacket with a white collar, further enhancing her creamy skin and the simplicity of the image. A large heavy pearl hangs from her left ear. The detail is minimal, the pearl is merely hinted at by the light catching it. Her large grey eyes look out to us with an ambiguous look, like that of the Mona Lisa but with a hint more sadness about it. The girl’s lips, rosy and recently licked are exquisite. The dabs of paint describe the fullness, the moistness at the middle and corners of her open mouth appear to be exhaling, maybe sighing. With a dark, nondescript backdrop the scene is quiet, still but there is a looming sense of it not staying that way. What is quickly discovered is that not much relatively little is known about Vermeer, and most of the information we do have comes from legal documents. The artist was from a poor family. It is unknown whether he was ever apprenticed, which may explain why his paintings are so individualistic. Though surely his Father’s art dealing business would have provided some formal education. At 21 he became a member of the Guild of Saint Luke, a trade association for painters. Four years later he found a patron, Pieter van Ruijven, who would be the main source of commissions throughout his life. It is known that he was a slow painter, producing around three canvases a year, painting with great care and using only high quality paints. His style, easily attributable, is clean, linear and strong in tonality. The use of colours such as Lapis Lazuli and Indian Yellow give the scenes a sort of hyper-reality, everything is perfectly perfect. Yet details like damaged brickwork make it all seem real. 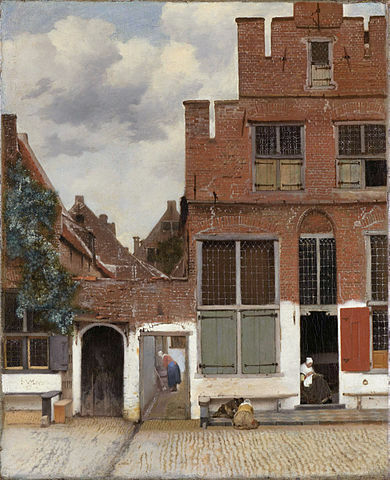 The Little Street (1657-58) is such a clear painting. He paints his hometown with the same dexterity as Canaletto, but without the pomp and fancy architecture. It’s more about industry and labour than pleasure and opulence. At a glance it seems an image of perfect town life, but upon closer examination we see chipped bricks and cracked walls. Did he paint this purely for what it is, or is there a meaning behind it? This external view is something of an anomaly in his work. His subjects were usually either domestic interiors, more often than not set in one or two rooms of his home. The domestic scenes, often revolving around a woman, either lost in thought or captured in the middle of an action such as washing a window or playing a virginal. He used what was around him to create a scene, whether staging his household staff or patrons he treats the subject with the same consistent honesty. 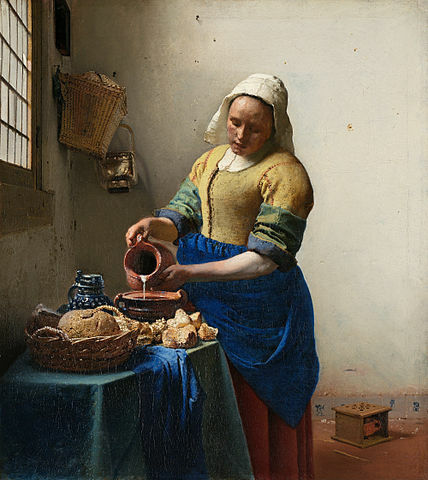 In The Milkmaid (c. 1658) a servant, who Graham-Dixon speculates is Taneke Everpoel, pours milk from a large terracotta jug into a bowl. Her expression is one of detached concentration, the scene is mundane. Her clothes are exceptionally plain, the ruggedness of her bodice is worn, her hood is a grubby white. But the apron around her waist is blue worthy of the Virgin. Her face is ruddy and her arms strong. There is evidence that Taneke intervened a threat of violence towards Vermeer’s wife Catharina by her mad brother, Willem Bolnes. Willem, who the family tried to have sectioned, threatened a heavily pregnant Catharina with a iron-tipped rod. Taneke disarms Willem and protects her mistress. With this in mind The Milkmaid has a very different context. Vermeer lived in the Dutch Golden Age was a time of growth, trade and art dealing. Being only moderately successful during his lifetime he was never wealthy. He converted to Catholicism to marry his wife who was of higher social standing than himself. Perhaps thinking that through his marriage he would escape the crime and scandal of his predecessors (one grandfather was a coin counterfeiter, one grandmother ran an illegal lottery, and his father committed manslaughter) it seems as though Vermeer was seeking peace, a new start, in a new place and with a new religion. The fact that he lived in his Mother-in-law’s home despite having eleven children indicates that he could not afford his own house. His domestic life was not a peaceful one. His mother-in-law was against the marriage from the start. Life in this house was dysfunctional and by all accounts not always happy. He died at the age of 43, penniless and in despair. 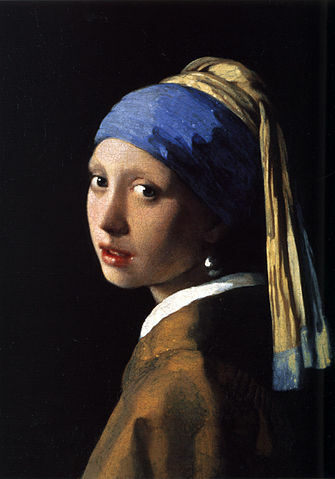 Although we still don’t know about the ‘madness’ of Vermeer his life was not as peaceful as his paintings. The intense sense of calm and serenity he painted were not a reality, and this mystery is what the presenter attempts to glean an insight into. His modernity and stylistic individuality, the immediacy and lack of narrative are the qualities which make him so intriguing. His obsession with counterfeiting in paint, creating ambiguity is enduring. His canvases capture a world, a moment both transient and eternal.